I was only familiar with the term as it related to art and design. In 2007 I began to hear it used to describe a lifestyle. I suspected it involved some vow of poverty. Somehow I found myself reading a blog, Zen Habits by Leo Babauta. This led to some other people who wrote about their own endeavors toward minimalism. People like Joshua Becker who writes at Becoming Minimalist. Also Joshua Fields Millburn and Ryan Nicodemus who write at The Minimalists. I would visit their blogs only occasionally. I was fascinated by their quest. Mostly because of their age. Even Leo was young compared to me. It seemed remarkable that young people could be so intent on altering their experiences, changing their lives and figuring out a better way of life to suit their goals. I was far less enlightened at their age. In fact, I was likely far less enlightened at my current, much older age! My oldest child, a son, was born in the summer of 1980. This summer he turns 32. He’s always been most interested in the experience. I had already seen how his generation seemed to be wired much differently than my own. Each generation seems to have some common qualities, likely the result of the society in which they spring forth. Just a guess. My generation was sandwiched between the War World II generation that believed in responsibility and doing the work AND the generation fueled by greed and the accumulation of material wealth. My adult life has been characterized by those two pressing drivers: working hard and getting ahead. Maybe that helps you better understand my fascination with minimalism. 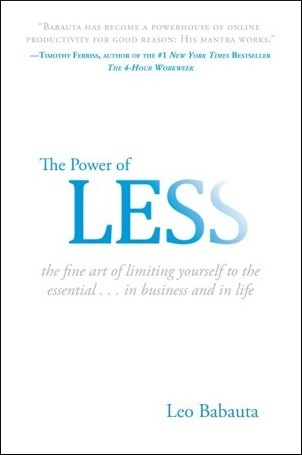 In 2009 Leo Babauta’s book was published, The Power of Less. I was quick to buy it and read it. Unfortunately, I didn’t read it with business in mind, even though the word “business” appears in the subtitle. I had blinders on and read it thinking primarily of an all-encompassing lifestyle. And it wasn’t hard to connect with the message because by now my generation, the 50-somethings, were doing something similar. We just didn’t call it the same thing. We called it simplifying or down-sizing. Mostly it was manifested in people who had worked hard to buy the big house in the suburbs so their growing families would have more space. Now, after years of hard work and having the big house, many aging Americans found themselves much like they started. As a couple. The kids grown. Mom and dad were now in a house too big for just the two of them. Tired of looking at the boxes of stuff they never used, many people embraced the new selling killing fields of eBay and Craigslist. The refrain, “We need to sell some of this stuff” was heard throughout middle-aged America. I still hear it today. Not only from my own mouth, but from the mouths of my friends. Truth is, we’ve just got way too much stuff. Some time ago I picked up Leo’s book again. But this time I had a different idea about how I’d read it. This time, I was going to read it with my business in view. How could I use the power of less to spawn, grow and sustain a business idea? Wasn’t it time to declutter my working world? I knew it was long past time. So I began to read it and take my time. No speed reading. No scanning. Read a page, think for awhile. Make some notes. Engage in some conversation. See where it all takes me. I know it’s not clean. I also know it’s honest. There is only one strategy here. To figure out some things. Maybe to just figure out one thing, myself. Ask any middle-aged person if they’ve got it figured out and they’ll tell you (if they’re honest) that they’ve only figured out there’s still so much they don’t know. The difference now is, they realize it. They once thought they were quite certain about many things. Life has a way of showing you how ignorant you really are. So today, with this episode I begin a renewed quest. It’s sort of a rebirth for things around here. I’d love to tell you that everything I do is strategic and well-thought out, but it’s not. I don’t trust people who tell me they’re that strategic. I’ve had many people throughout my life tell him how they think one of my natural aptitudes is “strategic thinking.” But I’m not being strategic about any of this. For starters, I don’t think I’ve got that much control or power in the universe. Fact is, bad things happen to good people. And good things happen to bad people. Don’t expect me to believe that everything you do in life is strategic and with thoughtful purpose. I know better. I’ve lived too long to know better. Today’s episode is a bit like a cooking show without a recipe. A show where we know we’d like to end up with something tasty and great…but we’re not yet sure what it will be. It’s an experiment in life. The ingredients are ones we’re going to find along the way. Like those survival shows, we’ll improvise. We’ll adapt. The important thing will be to remedy the immediate distress and think only about our next step. When we’re done, we’ll realize we’ve only started. And hopefully, if all goes well and the Lord’s willing, we’ll have found a business life that is more suitable for where we’re at in life.